Serious vaudevillian aims to bring the right kind of clown to the mayor's office. SPOTTED BY: Flickr user jer1961. 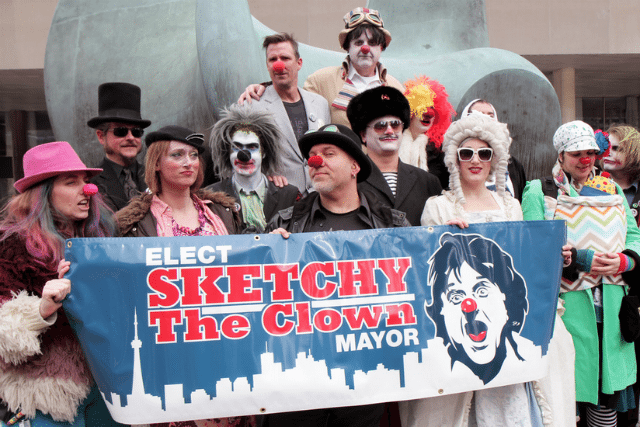 WHAT: Sketchy the Clown, officially launching his campaign for mayor. He’s got a website; he’s accepting donations; and he’s got a slogan: “You want a circus at city hall? I’ll show you a circus.” He intends to “set the bar higher for clown and circus comparisons” and to use pageantry, pratfalls, and red noses to highlight serious political issues. “We are going to spice up the municipal election to get people’s attention on some of the things that matter about running a city but are kind of boring,” his website explains. “Are people naturally interested in wastewater management? How about the details of the budget? What are all the functions of city hall? With a little entertainment thrown in, people may get engaged.” And this is no April Fools’ prank—Sketchy registered to run under his real name, Dave McKay, on March 25.